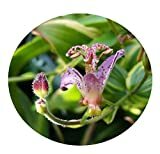 Tricyrtis lasiocarpa growing herbaceous geophyte of the genus Tricyrtis also known as Toad lily, Tricyrtis lasiocarpa perennial evergreen used as ornamental plant, can grow in temperate, subtropics or mediterranean climate and growing in hardiness zone 5-9. Leaves color green sometime with light and dark green arrange on the stems like part of it in ovate shape. 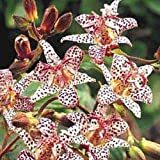 Flower color white with purple dots and spots, orange and yellow, there is six petals and 3 small inner petals. 2-4 cm flowers, the color white with purple dots or yellow and orange, there is six petals and 3 small inner petals.